Residential Flats in Ghaziabad | Saviour Builders Pvt. Ltd.
What are your expectations from the Noida real estate market in the year 2014? Noida and Greater Noida will continue to be one of the prime property locations in 2014. The number of infrastructure projects lined up by the Uttar Pradesh government and NCR Planning Board, including extension of Metro lines, makes these locations favourable for both end-users and investors. Among the stretches, Noida Expressway continues to be one of the finest road projects in the country, attracting a large chunk of investment for real estate development. Which areas are expected to see maximum development in 2014? Why? Among the specific areas in Noida, few sectors on Noida Expressway such as 137, 168, Greater Noida West (formerly known as Noida Extension) and areas on Yamuna Expressway falling under Greater Noida are expected to see maximum real estate development and deliveries in 2014. Where are your projects located and why did you choose these locations? Our project Paras Tierea is located in Noida sector-137 and other project Paras Seasons is located in Noida sector-168. Both the projects are strategically located with carefully designed layout. We are all set to start giving possession very soon. Which locations in the city witnessed maximum launches in year 2013? Why? Greater Noida West, Greater Noida and Yamuna Expressway witnessed the maximum number of projects launches in 2013 as there was easy availability of land. Moreover, the government has chalked out development plans for these areas. Moreover to improve the basic infrastructure along the fast developing Noida – Yamuna Expressway, there are plans for a new 20 km road network for better connectivity. What was the volume of sales and stock in the year 2013 vis-à-vis the last year? 2013 saw slower recovery of properties due to slowdown in economy, high interest rates and high inflation rates severely denting the savings of people. With new Reserve Bank of India’s policy on repo rate, we are looking forward for more stable market in 2014. What will be the impact of the upcoming general elections on the real estate sector in Noida? There are two factors that impact the real estate market of any particular area in country – local and national. Locally speaking, since the state government will remain the same before and after the general elections, so their policies, in all likelihood, will remain the same. However, for the national factors, such as interest rates, Real Estate Regulatory Bill, Land Acquisition Act etc, we expect some concrete steps from the next elected central government. 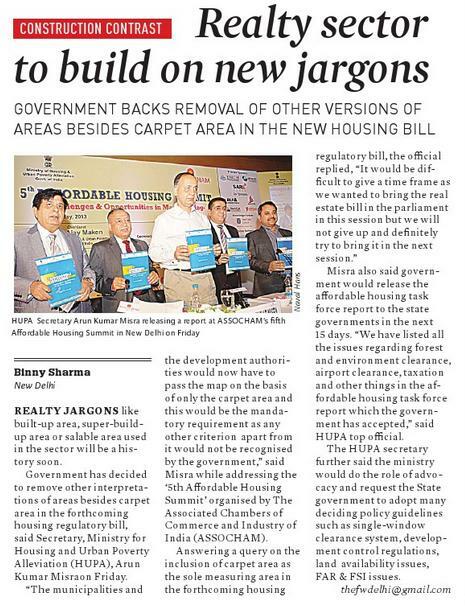 The outcome of these steps will determine the direction of the real estate sector. What are the developments expected in 2014? We expect the concerned authorities and governments to act swiftly on the implementation part of infrastructure projects such as Noida City Centre – Noida Extension line and Greater Noida – Agra metro project. The state government has increased the ready reckoner (RR) rates for residential and commercial properties by up to 20% in municipal corporation areas of Pune, Thane, Navi Mumbai and Mumbai from the new year. RR rates have been increased by over 20% in only 26 zones of the total 737 zones into which Mumbai is divided. The increase in rates mostly affects select tony areas like Worli, Napeansea Road, Altamount Road and Carter Road. In 2012, the government had increased RR rates by a maximum 30%. RR is an annual statement of propert rates based on which the stamps and registration department collects stamp duty from property buyers. The government intends to garner over Rs 20,000 crore in 2013-14. Tax collection through stamps and registration is the highest source of revenue for the state. The real estate sector and the ruling and opposition parties had strongly opposed any rise in ready reckoner rates due to the current economic slowdown and deteriorating financial condition of the sector. Property buyers would have to shell out more, as based on the revised RR rates, they would also have to pay higher value added tax, service tax and stamp duty. Senior town planning officials said the hike in RR is not much compared to the property rates in the open market and contrary to the perception that the economic slump had slowed down property transactions. “Mumbai in fact, saw an increase in the registration of property documents. Over 2.07 lakh property documents were registered from January to November 2013 against 1.98 lakh documents for the same period in 2012. The reason for the hike in registration numbers could be the recent new change in income tax rules of valuing property as per RR rates. Consumers may have seen a benefit in registering their property,” said an official. With over 24 years of experience in the real estate business, Supertech Limited has already delivered more than 33 million sq ft of residential and commercial entities. In addition to the metro cities, such as Noida, Greater Noida, Gurgaon, Ghaziabad and Bangalore, the developer also has a strong presence in smaller cities such as Meerut, Moradabad, Haridwar and Rudrapur. Currently, Supertech has over 75 million sq ft under construction. In conversation with Magicbricks.com’s Nikunj Joshi, R K Arora, chairman & managing director of Supertech Limited said that owing to infrastructure upgrades announced by Uttar Pradesh government, Noida realty market will continue to grow in 2014. What are your expectations from the Noida’s real estate market in the year 2014? Noida has experienced a period of unprecedented growth over the last few years, which is expected to continue in future also. It has emerged as a well-developed micro market having substantial office and retail space, with commercial activity deepening in its various sectors. Rapid commercial development has led to a spillover of housing growth in and around the region. Also, benefitting from metro extensions, expressways, wider highways and release of land parcels, Noida promises to be a great residential destination in the coming year. Which areas are expected to see maximum real estate development in 2014? Why? There has been a lot of development across various sectors in Noida, witnessing healthy absorption trends. Yamuna Expressway is becoming a hub for the real estate market. The projects in the area have received overwhelming response and the fact that the land prices are still low as compared to Noida and Greater Noida makes it a perfect location for investment. Greater Noida West will also be in the limelight for progressive growth of residential and commercial hubs. Great infrastructure, good road network and metro connectivity are the prime reasons that have enticed the buyers and investors to this area. Certainly, there will be a temporary setback as the industry will face labour shortage, putting more stress on the developers as well as buyers. After the recent elections in four states, the sales have started improving. We are hopeful that the same will repeat in the forthcoming general elections also and once a new government is formed, the market is expected to improve significantly. Owing to the presence of abundant land parcels and competitive affordability, project launches were concentrated in Greater Noida West and Yamuna Expressway in comparison to prime locations of Noida where land is scarce and costly. Any infrastructural development that had a positive impact on the real estate sector in the city in 2013? Many infrastructural developments took place during the year but the biggest developmental kick was the announcement of 12 projects worth Rs 3,337 crore by Uttar Pradesh government to develop infrastructure across the state. The projects encompass Noida, Greater Noida and the Yamuna Expressway. Also the proposal of a new metro rail network between Noida and Greater Noida will further boost the area’s realty market. Did you launch any new projects in 2013? If yes, where? Have you given possession of any of your projects in 2013? While we launched residential projects Araville and 48 Canvas in Gurgaon, Albaria and King Towers in Greater Noida (West), Golf Village, Disney Inspired Fable Castle in Yamuna Expressway and River Crest in SIDCUL Rudrapur during the year, we gave possession in Supertech Livingston-Ghaziabad, 34 Pavilion – Noida, Palm Greens/Meerut Sports City – Meerut and Czar Suites – Greater Noida. What includes your wish list for the real estate sector in 2014? Government agencies should settle the issue of farmers in Noida to ensure smooth implementation of projects; Real estate should be given the status of ‘infrastructure’ by Central Government to avail funds from authorised sources; Clarity on policies concerning special economic zones, land acquisitions and certain taxes and single window clearance to fasten the approval process. Property market of the National Capital Region (NCR) saw 39 per cent fall in the new launches of apartments to about 7,600 units during January-March period compared with the previous quarter, global realty consultant Cushman & Wakefield said on Monday. In the top eight cities of the country, Cushman & Wakefield (C&W) said that an estimated 38,000 residential units were launched in the first quarter of 2013, registering a marginal fall of about 2 per cent over the previous quarter. These major eight cities are – NCR, Chennai, Kolkata, Bengluru, Mumbai, Hyderabad, Pune and Ahmedabad. NCR witnessed the launch of approximately 7,600 units, a decline of 39 per cent compared to the previous quarter, C&W said in a statement. The new launches were concentrated in the suburban locations of Gurgaon (66 per cent) and Noida (34 per cent) with over 80 per cent of units catering to the mid-range segment. Due to the subdued demand, Noida witnessed a steep decline in new launches at close to 70 per cent and ended up being the primary contributor for the overall decline in number of launches in the NCR, the consultant said. Chennai, Mumbai, Hyderabad and Ahmedabad also witnessed decline in new launches of residential units by 39 per cent, 3 per cent, 89 per cent and 62 per cent, respectively. New residential units launched more than doubled in Bengluru and Pune in the last quarter, increasing by 144 percent and 109 per cent, respectively, C&W said. Kolkata saw a modest 3 per cent increase. On prices, the report said that most locations in Delhi witnessed stable capital values in both mid and high-end segments. However, capital values in high-end segment in South Central Delhi witnessed 15 per cent appreciation over last year due to limited supply and high demand. Among the suburban locations, Gurgaon saw higher appreciation due to the high demand from both end-users, the workforce working in the various companies located here and investors, coupled with the limited project completions. Gurgaon (NCR) saw a change in the capital values in the luxury/high-end and mid-end residential segment at 29 per cent and 18 per cent, respectively, over last year, C&W said. For any information on Saviour – Real Estate Developers and Builders in Delhi NCR, EMail Us. With the three development authorities of Noida, Greater Noida and Yamuna Expressway having revised their land prices, the dream to build or buy a house of one’s own has become costlier. These authorities have raised the land prices by up to 40% of their current rates. The Greater Noida Industrial Development Authority (GNIDA) has prepared a new formula for land procurement under which it can directly purchase land from the farmers. GNIDA has sent this policy to the Uttar Pradesh state government for its approval. Under the new policy, landowners or farmers will have two options: either they directly sell their land to GNIDA or go through the provisions of Section 4/17 or Section 6/17 of the land acquisition policy. For direct land purchase, farmers or landowners will get an additional 20% of the declared compensation (Rs 1,512 per sq metres) as a no-litigation bonus. In addition, they will also benefit from the rehabilitation policy. GNIDA has already raised by 45% its existing budget for infrastructural development and social services, which now stands at Rs 7,005 crore in the financial year 2013-14. GNIDA and the Yamuna Expressway authority have also increased the compensation rate by 15% to be offered to farmers for acquisitions, besides providing a host of other benefits to them. The Noida authority has announced the setting up of the Noida Metro Rail Corporation (NMRC) as a special purpose vehicle to facilitate the construction of a proposed Metro line between Noida and Greater Noida. The Metro line, first mentioned in January, will be constructed without DMRC’s help, and is an initiative of the Noida and Greater Noida authorities. Rama Raman, the chairman and chief executive officer of GNIDA, says: “The NMRC will see an initial investment of Rs 1,000 crore. In an earlier board meeting held in January, a 29km-long Metro line was announced between Noida and Greater Noida, at an estimated cost of Rs 5,064 crore. To facilitate this, the Noida and Greater Noida authorities have begun the process of setting up a special purpose vehicle, the NMRC, which will see an investment of Rs 1,000 crore. We will soon approach the registrar of companies, Uttar Pradesh, for clearance and work on the NMRC will begin soon. The board passed an MOU with regard to the extension of the DMRC line between Botanical Garden and Kalindi Kunj. The 3.96km line is to be built at a cost of Rs 845 crore. We have already passed the MoU from our end and will seek the clearance from the UP government. After that, the proposal will go to the Union urban development ministry for final clearance.” Around 22 stations have been proposed to be built on this Metro line, which will run along Noida-Greater Noida Expressway. The line will between City Center, Sector 32 and Depot Station (Bodaki). The proposed stations on the route will include Sector 51, Sector 50, Sector 78, Sector 101, Sector 81, Dadri Road, Sector 83, Sector 137, 142, Sector 143, Sector 144, Sector 147, Sector 153, Sector 149, Noida and Knowledge Park 2, Knowledge Park (future), Pari Chowk, Alpha 1 Alpha 2, Delta 1 (future), Knowledge Park 4, and Depot Station at Bodaki, Greater Noida. The authorities estimate that nearly 65,000 passengers will use the Metro every day. The proposal to extend the City Center Metro line by 6.67km to Sector 62, touching NH-24 has also been approved. The DPR for this much-delayed project has been forwarded to the UP government. In addition, the Noida-Greater Noida authorities have also decided to go ahead with civil work on the Metro link between Noida and Greater Noida West (Noida Extension). In Noida, the allotment rates of group housing, residential and institutional properties have been raised by 15%, commercial and industrial land rates have gone up by 30% and 11.25%. In Greater Noida, the allotment rate for land across all categories, except industrial, has been uniformly revised by 8.53%. The Yamuna Expressway area has also seen a raise in allotment rates of all categories of land by about 15%. The allotment rate for industrial properties remains the same as last year. In July 2012, the development authorities had raised the rates between 7.5% and 40%. The raise is especially important for the GNIDA, which is reeling under a major cash crunch. “The increase in rates was essential considering our current funds shortage. The land row in Greater Noida West also imposed an extra burden on the authority in the form of enhanced compensation and rehabilitation packages for the farmers. Besides, many development projects have remained stalled for months,” Raman said. According to the new allotment rate, residential properties in Noida have been revised by at least Rs 8,115 per sq metre in A Category sectors like 14,14A, 15A, 17, and 44 and by Rs 2,950 per sq metre in E Category sectors like 102, 115, and 158. Grouphousing flats in Noida have are costlier by almost Rs 11,065 per sq metre in A category areas and by Rs 4,180 per sq metre in E category zones. In the institutional category for IT/ITeS properties, Noida buyers will have to shell out Rs 33,940 per sq metre now. For plots in Phase I and III industrial areas of Noida, the allotment rates are Rs 20,990 and Rs 7,740 per sq metre. Now residential flats in Greater Noida will be costlier by almost Rs 1,592 per sq metre while for commercial space, an extra Rs 3,155 per sq metre will be charged. The new allotment rates in Yamuna Expressway Industrial Development Authority (YEA) have also been increased between 14% and 18%. R K Arora, chairman and managing director of Supertech Limited, says: “Undoubtedly, it’s a steep raise and going to affect the buyers and investors who were looking at this booming region as a reasonable and affordable zone. It can be detrimental to real estate business. The fast developing zones like Noida, Greater Noida and Yamuna Expressway are known as prime and ideal location for affordable range houses. Now it is no longer the same due to the rise by 8.53-30% in allotment prices across all categories of land. “The increase in the allotment rate is a bit too much as a marginal increase could have been a better idea. Though the present buyers need not worry about the increase in prices, in new projects there can be an increase in prices. Buyers would be affected by the increase in prices. People who have been buying smaller plots of 100, 200, 300, and 500 sq metres will now be more interested in group-housing projects due to the increase in prices,” Ashok Gupta, managing director of Ajnara India Ltd, said. For any information on Saviour – Real Estate Developers in Greater Noida, EMail Us. For any information on Saviour Builders Pvt. Ltd., EMail Us. Housing prices have increased by an average 66 per cent in Mumbai over the last four years on account of steady demand and rising input costs, according to property consultant Jones Lang LaSalle (JLL). The incredible increase has been even higher at 70 per cent in Thane and 74 per cent in Navi Mumbai. ‘The cumulative price escalation figures for Mumbai, Thane and Navi Mumbai represent the highest among all cities in India,’ Jones Lang LaSalle India Managing Director (West) Ramesh Nair said in a statement. Gurgaon and Bangalore saw price appreciation rates of 52 per cent and 46 per cent, respectively, during this period. ‘Residential property prices in Mumbai have increased steadily after the correction seen post the Lehman debacle. In the period from the second quarter of 2009 to the same quarter in 2013, residential real estate prices in Mumbai have increased by 66 per cent,’ Nair said. On reasons for price rise, Nair noted that the demand for investment residential properties and end-user homes in the country’s financial capital has remained stable. That apart, the consultant attributed the prices movement to limited supply of clear land, reduction in new launches between 2011 and 2012 middle and high interest rate scenario. ‘In the Indian city which has for years carried the unwholesome reputation of being the most over-priced in terms of residential real estate valuations, there is no relief in sight for aspiring home buyers. ‘Over the last four years, property valuations in the financial capital have increased by an average of 66 per cent. All ‘expert’ predictions over the last three years, of an imminent correction have proved to be wrong,’ Nair observed. Experts foresee a boom in commercial real estate now that the government has done away with the minimum requirement of 24.7 acres for setting up an IT/ITeS SEZ “THESE changes are likely to make the SEZ policy more inclusive by attracting SMEs to consider their options ” Ritwik Das Managing director, Bluechip Projects. LAST month the Centre removed the mandatory requirement of 24.7 acres of minimum land area for setting up a IT/ITeS SEZ and announced that with immediate effect, the minimum built-up area requirements to be met by SEZ developers will be 24.7 acre for the seven major cities, 12.35 acre for Category B cities and 6.17 acres for the remaining cities. Industry experts and realty players see this as a landmark move that will have wide-ranging implications on commercial real estate in India. It is likely to be a major boon for the IT sector as well, experts add. “The first and most encouraging impact of these amendments to the previous requirements, which were a major hurdle, is that many more IT companies will now be able to launch their own SEZs. Previously, only the largest IT players could own IT SEZs given the capital required to buy 25 acres of land. Now, developers will be able to aggregate smaller contiguous land parcels and turn them into SEZs. In cities such as Chennai and Bangalore (where the floor space index or FSI for IT parks is as high as 3.25-3.75, an SEZ project can now be developed on a land parcel as small as seven acres. ),” said Ramesh Nair, managing director-west, Jones Lang LaSalle India, to FC Build. The new announcement by the Centre has come as an annual supplement to the foreign trade policy aimed at enhancing exports and easing export procedures. Announcing the supplementary foreign trade policy, union commerce and industry minister Anand Sharma had said the government has taken note of the fact that there are acute difficulties in aggregating large tracts of uncultivable land that is vacant to set up SEZ and the new move stemmed from the realisation of that difficulty. National Association of Software and Service Companies (Nasscom), the apex body of IT and ITeS companies in the country, is understandably happy. Looking at it from the perspective of IT and ITeS firms, Nasscom president Som Mittal says removing the minimum land requirement and reducing the built up area will enable the SEZ scheme to realise its true potential. From the developers’ point of view, too, there are reasons for cheer. Consider what Ritwik Das, managing director, Bluechip Projects, which is developing a number of commercial projects in tier-II and tier-III cities, has to say. “Large mandatory land requirements often made it difficult for small companies to take advantage of the SEZ policy. Doing away with the land requirement and reducing minimum built up area will now make it feasible for IT SEZs to come up in tier-II and tier-III locations in many parts of the country. These changes are likely to make the SEZ policy more inclusive by attracting SMEs to consider their options. Developers would be all the more interested in taking up such commercial property developments in tier-II, tier-III cities, because the possibility of having large unsold properties would be less, or to put it more positively, there will be more ready market,” said Das. That’s not all. The new scheme of things will pave the way for conversion of part of the built up area into residential properties, which in turn may open up new vistas for developers. “Some IT SEZ developers who have already met the 24.7 acres built up area criterion will now convert the balance land for residential use, giving the mixed-use edge, while also making the formation of many more walk-to-work residential projects possible. Real estate developers will now be able to divide up their land holdings and allocate smaller parts to IT companies to construct their own IT SEZs,” says Nair of Jones Lang LaSalle India. There are many developers who consider this to be a more pragmatic option in the present market scenario. Rohit Poddar, managing director of the Mumbai-based Poddar Developers, for instance says, “This certainly is a positive development that will create additional supply as the development norms are more realistic given the market conditions.” Significantly, the transfer of ownership of SEZ units including outright sale has now been allowed in the new scheme of things. Real estate consultants and analysts think this move will also have a positive impact on developers. “In the overall perspective, at times one needs to exit from SEZs also. The easier and smoother these exit will be, the better. With the new policy in place, it will now become easier to exit from SEZs. Besides, real estate private equity (PEs) funds with foreign capital will now be able to do a number of smaller deals, which in turn, is bound to bring in more FDI (foreign direct investment) inflow into the sector,” said Nilesh Biswas, managing director, Calcutta Skyline, a Kolkata-based real estate consulting, research and broking company. On the issue of possible FDI inflow into the commercial realty space, Nair says that the infusion of FDI into the real estate markets of smaller cities can also become a critical factor in IT/ITeS companies deciding to move into these cities – with an obvious positive impact on their local economies and, therefore, the growth of their real estate markets across all segments. For any information on Saviour Builders Pvt. Ltd., Mail us at pr@geniepr.com. Babus in the central government have sought a unique compensation for vacating a plot of land at the Mumbai airport – get the company that owns the airport to build swanky sea-facing apartments for themselves in tony South Mumbai for free. In a first-of-its-kind barter deal between the government and a private firm, Mumbai International Airport (MIAL), the company that operates Mumbai’s airport, has been asked by the Central Public Works Department to build a new tower at Hyderabad Estate on Nepean Sea Road, an office building in Kane Nagar near Dadar and a 50-apartment block near the airport in return for vacating a 13-acre airport land, where the department has had 278 houses and a few godowns for 50 years. The prestigious Hyderabad Estate – where several top bureaucrats, including IAS officers, chief commissioners of income-tax as well as officers of the customs and excise departments, have lived for over four decades – is in an elite neighborhood that houses the residences of many of the country’s big industrialists. Apartments in this area sell for between 20 crore and 50 crore. The government colony near the airport has a built-up space of 1, 67,174 sq ft, and as per the arrangement, MIAL will rebuild as much space for CPWD in the three locations. There will be no transaction, a senior official at the CPWD told ET, requesting not to be named. He said the government is faced with a severe shortage of homes for its senior officers in Mumbai, where real estate prices have shot up in the past few years. “A block of apartments on Nepean Sea Road, another 50 apartments near the airport and an office building – all for free – is what we thought is a damn good idea,” the senior CPWD official told ET. GVK, which owns MIAL, did not respond to an emailed questionnaire.